General Dampierre (who was saved from the guillotine by being mortally wounded in 1793) said that the French soldier depended implicitly on the superiority of his artillery and that there was a noticeable lessening of his courage if he saw that artillery receive a check or draw back. 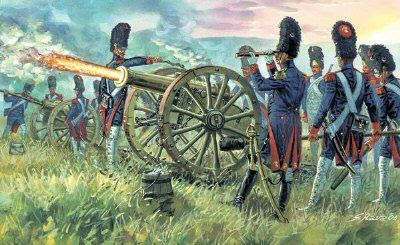 Throughout the wars of the Republic the excellent French artillery made up for many deficiencies in the other arms. The new horse artillery made its first effective appearance of the Battle of Jemappes on 6th November 1792, when several batteries went into action. Although many of the men could as yet hardly ride, the batteries did so well that every general wanted them. Marshal Saint-Cyr gives in his Mémoires an incident at the siege of Kehl in January 1797 which showed the tremendous pride in their arm possessed by men of the horse artillery. One of the siege batteries had been especially allotted to a company of horse artillery. But although the battery came under very heavy enfilade fire the men would not construct any earthworks to protect themselves from it. Their reply to instructions to do so was that they were horse artillery who fought in the open, and not behind entrenchments; and that if they were permitted to do so they would demolish the defences which had been erected against frontal fire. They had their way, and each morning by 9 o’clock their guns had been smashed and half their men killed or wounded. The superiority of the French artillery was not due to its equipment, but to its tactical handling and to the efficiency and esprit de corps of its officers and men. That superiority was very marked, for instance, in the Jena-Auerstädt campaign of 1806. The Prussian army had a greater ratio of artillery to infantry than the French; but in the artillery, as in the other arms, the Prussian officers were still following the teachings of Frederick the Great. In their time these had been revolutionary, but that student of the art of war, Napoleon, had absorbed the lessons and had superimposed his own system of a massive artillery reserve, in order to achieve artillery superiority at the decisive point. 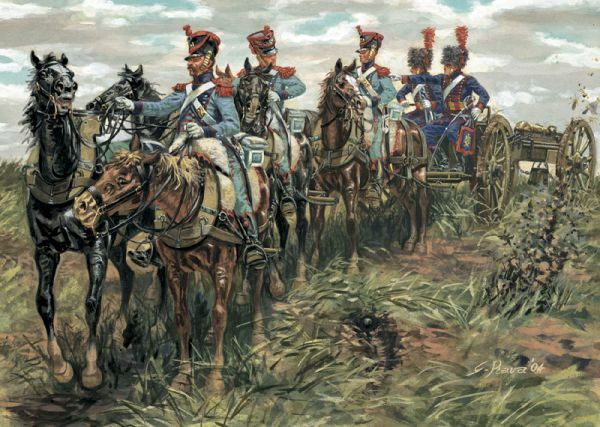 To take another example, the Russian artillery was excellent as regards its equipment, but it was poorly commanded. Sir Robert Wilson writes: ‘The Russian artillery is of the most powerful description. No other army moves with so many guns and with no other army is there a better state of equipment, or more gallantly served. The piece is well formed, and the carriage solid, without being heavy. The harness and the rope-tackling is of the best quality for service, and all the appurtenances of the gun complete and well arranged. The draught horses are small, but of great muscular strength, strongly loined, and with high blood. Four draw the light field pieces, and eight the twelve pounders; the latter have sometimes indeed ten horses.’ The extra horses were required for the dreadful Polish roads, before the frost stabilised the bottomless mud and after the thaw some months later. ‘The drivers,’ says Wilson, ‘are stout men: like all other drivers, they require superintendence in times of danger, to prevent their escape with the horses, but on various occasions they have also shown great courage and fidelity; and they have the essential merit of carefully providing subsistence for their horses. Neither gun, tumbril, nor cart belonging to the artillery is ever seen without forage of some kind, and generally collected by the prudence and diligence of the drivers.’ But the junior officers in the artillery were poor, and on active service an officer of cavalry or infantry was frequently appointed to the command of batteries. Shortly after the Battle of Jena, the artillery of the Guard arrived, and Boulart, with his artillery division, was transferred on attachment to Oudinot’s special infantry division, composed of grenadier and light infantry battalions. But Boulart had made his mark and before the 1809 campaign he was posted to the Horse Artillery of the Guard as a Chef d’Escadron. He was soon promoted to Chef de Bataillon in a new regiment of Foot Artillery of the Guard, discarding rather reluctantly the blue dolman and pelisse of the Guard’s Horse Artillery. 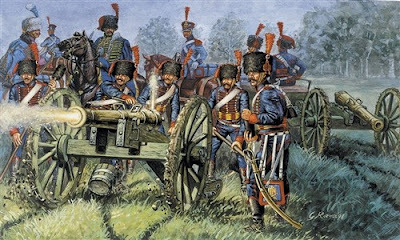 When the French army entered Vienna in 1809, Boulart was commanding two batteries of the Foot Artillery of the Guard, equipped with a total of twelve pieces of ordnance. The Emperor inspected these two batteries at one of the daily parades at Schoenbrünn. As usual, he went into great detail, but found everything in order. One of the gunners, however, told the Emperor that one of the 12-pr. guns was ‘mad’—that is, its fire was a little uncertain. At daybreak on 22nd May Boulart, who had his two batteries on the north side of the island of Lobau and close to the river, was ordered to send one of his batteries forward with the Chasseurs of the Guard. Leaving one battery close to the bridge, Boulart followed the chasseurs with the other towards Essling. He brought his battery into action but was soon overwhelmed by the Austrian fire, his battery commander losing an arm and he himself being slightly wounded. The position was untenable, and he moved the battery closer to the chasseurs, establishing it in a tile factory by the village of Gross-Aspern. But he had to contend with the fire of at least twelve pieces against his six. Short of ammunition, he sent back for more, but all the ground to his rear was swept by the heavy enemy fire. Finally, when half his men and a third of his horses were out of action, lack of ammunition forced him to cease fire and give way to a fresh battery. Marshal Masséna was now 300 to 400 yards in rear with the Chasseur Division of the Guard, and Boulart reported to him and remained with him until the end of the action. Masséna told him that the Austrians had cut the bridge over the Danube and thus their communications. That night the army withdrew to the island of Lobau. Boulart writes that, ‘On the 26th, as soon as the bridge was rebuilt, the Guard and my artillery crossed to the right bank, and moved to the village of Ebersdorf where Imperial Headquarters was. I had hardly been there an hour when the Emperor sent for me. I was taken into his office where he was standing by a table on which maps were spread out. “Have you brought back all your artillery?” he asked me. “Yes, Sire.” “Have you any ammunition left?” “Some grape shot but no round shot.” “And why have you not spat that out at the enemy’s face?” “Sire, because I was not within range, and the position of my battery was subordinated to that of the troops to which I was attached. Marshal Masséna, who was there, could see that I was not able to do more.” “How many men and horses have you lost?” “Sire (I gave him the figures).” “And your mad piece, did it fire well?” What a memory to recall such a minor detail! Nothing escaped him. “Yes, Sire, its fire has been better for I gave it my personal attention.” “And your other pieces, are they in good condition?” “Sire, there is one of which the vent is greatly widened and which has need of a vent lining.” “And why, Sir, has this lining not already been fitted?” He added in a high and angry tone, “In what regiment have you served?” This outburst, absolutely undeserved, disconcerted me a little. “Sire, I arrived on the Isle of Lobau where I had no resources with which to carry out this repair. There is only the arsenal at Vienna that might be able to do it, and already I have made arrangements to send the piece there.” “Yes; expedite its departure; tomorrow I will inspect your artillery and you will show me the repaired piece.” “Sire, your orders will be carried out.” I knew the thing impossible, but it was no good saying so. The Emperor knew nothing of impossibilities. ‘I was very worried when I left him, but I set about taking action immediately. I sent Captain Lefrancais to Vienna with the piece, telling him to expedite the repair if he could find at the arsenal a machine to install vent linings. But Captain Lefrancais would not be able to return in time for the Emperor’s inspection; and it was necessary, therefore, to procure a gun to replace temporarily the missing one. It seemed to me that it should suffice if the Emperor could see that my batteries were complete and ready to move. I hurried to see General Songis, to tell him of my trouble and seek his help. “I would willingly do so,” he said, “but in fact there are only Austrian 12-pr. guns in the general park, though these are of the same calibre as ours. If you wish I will put one at your disposal.” For lack of anything better I accepted; but the thought of the inspection the next day depressed me. The Emperor would of course notice the absence of my piece; and what would he say if he was still in his present bad humour? At least I would not fare any better, and at the worst I should get another “broadside”. This account by Boulart tells us more about the personality of that remarkable man the Emperor Napoleon than do many books that have been written about him. 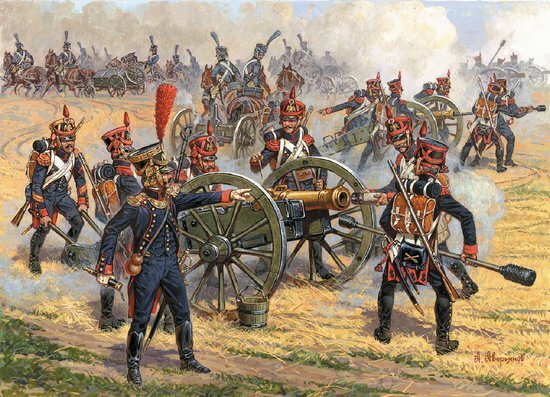 At the Battle of Wagram, which followed shortly after this incident, the French artillery fired 96,000 rounds. The day after the battle Boulart visited the ground which the Guard artillery had ploughed up with its projectiles and he did not find that the damage done was proportionate to the ammunition expended. Other parts of the field reinforced this impression. And yet never had such a mass of artillery been assembled, producing such a brisk, continuous and frightening noise; for those who heard the uproar from afar believed that the two armies were destroying themselves. After Wagram, Boulart was promoted Major in the Guard, which gave him the rank of Colonel in the Line and the tide of ‘Colonel-Major’.